The outlook for beef and sheep businesses is encouraging – while milk price increases look like restoring profitability for a typical dairy business this year. Those are the upbeat forecasts from specialist consultants Andersons, released for next week’s Dairy Event and Livestock Show. Two reports will be launched by Andersons’ director Richard King at the show, using the company’s Friesian Farm model to look at profitability trends and forecasts for the dairy sector, and the profitability of red-meat production by taking data from Anderson’s Meadow Farm model. The dairy report predicts prospects looking up for 2012 and 2013, but this relies on the market delivering further price increases, and costs abating. It states: "There have been significant milk-price rises over the last year. It is believed further increases should be forthcoming during the remainder of the year. This will partly be driven by the whole UK milk market belatedly catching up with booming global commodity prices. It is also envisaged that payments under standard liquid milk contracts will increase to reinstate the customary premium above milk going for commodity uses. "This is to reflect the higher costs involved in achieving level production, but also to secure supplies as milk production contracts. Thanks to these milk price rises, the average price for the current production year is estimated to be almost 3ppl higher. Unfortunately, this will not translate directly into higher profits." While variable costs will increase compared to last year, largely driven by rises in feed and fertiliser prices, there were other factors, often overlooked, such as straw, veterinary and medical, seed costs and dairy consumables. In terms of overheads, fuel and electricity contribute to the cost increases. Wage costs also continue to rise. The report adds: "The net effect is a positive margin from production – but only at very low levels. The return on capital is around 2.5 per cent. This is obviously too low for long-term sustainability. "Looking to the future, it is believed that milk prices may increase a little more for the 2012-2013 year. Whether this happens is highly dependent on how the pound moves against both the dollar and euro, and currencies are presently very unstable. But the fundamentals of global dairy commodity markets seem reasonable for the immediate future. "There is some hope that costs may abate for the next milk year, albeit marginally. Fuel and fertiliser values may not reduce much, but feed costs should fall with weakening cereals markets. But any reduction is raw material costs are unlikely to have a huge effect on winter feed costs, so an improvement for 2012-2013 is perhaps more realistic." If the Single Farm Payment and environmental schemes support were to fall in CAP reform, which seemed likely given the current proposals, then the income from them would need to be replaced, it states. The report goes on: "The dairy supply chain must recognise that higher prices need to be paid to the primary producer, if milk supply is to be maintained. "But at the same time dairy farmers can do a great deal to help themselves through increasing their business efficiency. 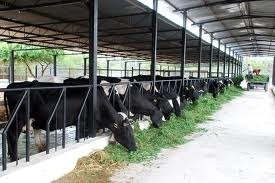 This should start with operating a system that fits in with the characteristics of the farm and its owner, and also the milk contract the business is supplying. Controlling costs is then key. With the current high price of all inputs, there is an increased focus on producing milk from grazed grass – the cheapest way to feed cows." The variable costs of producing a litre of milk from grazed grass will be in the region of 3½p. From silage it is 7p, and from concentrates it will be 12p. It adds: "As a method of reducing costs, there is an increasing trend within the sector for joint-venture arrangements. Not only do these produce cost savings, but also allow structural change within the industry – allowing the best businesses to grow, whilst also offering those who wish to exit day-to-day dairying a greater range of business options."